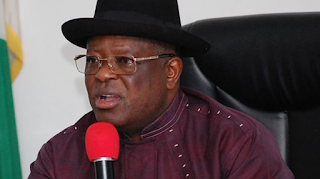 Governor David Umahi of Ebonyi on Sunday warned against a selective method of fighting corruption, if the government was desirous of a successful anti-corruption fight. According to him, if the government desires to achieve overwhelming result in its fight against corruption, it must adopt inclusive approach rather than selective method. The governor made this remark at a media chat to mark the occasion of the 2018 Democracy Day at the Government House, Abakaliki. He added that such approach should also be devoid of any political undertone for the efforts to have a wide public acceptability. The governor said Nigerians should laud the federal government for its determined effort in tackling the ugly monster in the country. He noted that it was imperative for the Nigerian government to reduce corruption to its barest minimum in in order for the country to regain its pride of place among the comity of nations. The governor, however, opined that proactive measure rather reactive measure, would give the nation the much desired result in its quest to reducing corruption to its barest minimum. “I recommend proactive measure for the fight against corruption. President Muhammadu Buhari’s ant-corruption fight is laudable; he means well and he is a man of integrity. “I support the call that those who had embezzled our money should be able to give account of it and we must have the fear of God in whatever we do,” Mr Umahi said. On his administration’s achievement, Mr Umahi noted that various ministries, departments and agencies in the state had performed optimally. He said his administration had focused mainly on people oriented programmes, especially in the area of empowerment, and the payment of hospital bills for indigent persons in the state among others.